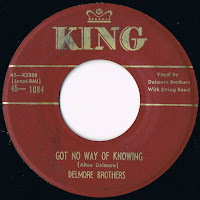 I first learned of the Delmore Brothers when hearing their "Rounder's Blues" years ago. This song was recorded at a time, when they were already recording boogie oriented numbers. "Rounder's Blues," however, was pure blues material, which could have been recorded easily ten years earlier by the Delmores. I was instantly struck with their intense harmony singing and the powerful harmonica solos by Wayne Raney. The brothers had developed their own sound by then, comprising boogie woogie elements, their close harmony singing, and a signature sound provided by their guitars, electric lead guitar and energetic harmonica performances by Raney or Lonnie Glosson. The Delmores were Alton, born December 25, 1908, and Rabon, born December 3, 1916, to Charles Edward (1875-1951) and Mary Ann Delmore (1978-1958). The brothers had six other siblings and were born and raised in Elkmont, Limestone County, in the Alabama mountainside. Their musical influences rooted deeply in white gospel music and old-time. Their mother composed several gospel tunes and was joined by Alton later on. The brothers formed a duo in 1926, whem Rabon was just ten years old. They built up a local reputation by singing at fiddle concests and took a first try at recording when they held a session for Columbia on October 28, 1931, in Atlanta. 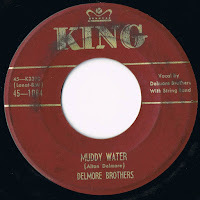 Two tracks were produced, "Got the Kansas City Blues" and "Alabama Lullaby," which were released on Columbia #15724-D. 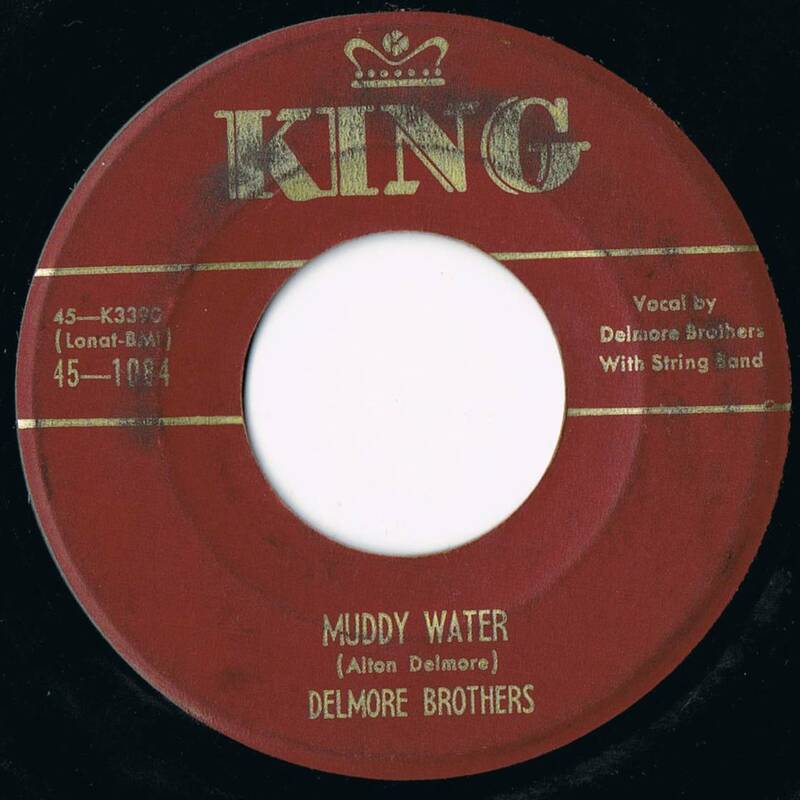 In 1933, the Delmores began a longer association with Bluebird and recorded countless singles for this label during the 1930s. 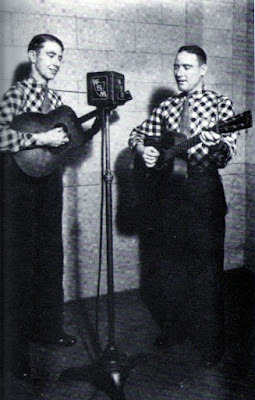 The duo soon became a member of the Grand Ole Opry and built up a high popularity at the show. Their stint with the Opry ended in 1939 due to disagreements with the show's management and their popularity ceased again. At that time, the brothers were backing their harmony singing mostly with their own guitars. Their style was bluesy and clear, comparable to the Carlisle Brothers, but much smoother. Their association with Bluebird ended in 1940 and they began recording for Decca that same year. Although record sales were still good, the Delmores struggled to find a solid radio station base to broadcast. By 1943, they settled in Cincinnati, which borught them back on the map. That year, Alton put together the "Brown's Ferry Four," a gospel quartet consisting of Alton and Rabon, Merle Travis, and Grandpa Jones. The group began recording for Sidney Nathan's King record label in Cincinnati and soon, the brothers were allowed to record solo sides again. On King, they found their signature sound, fusing their blues and gospel roots with boogie woogie. 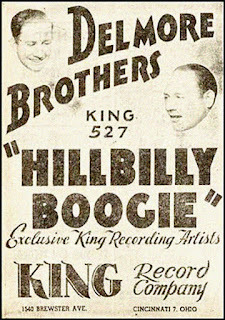 "Hillbilly Boogie" was the first of those, cut with Merle Travis and Louie Innis on guitars and Roy Starkey on bass in Hollywood. Adding electric guitars, bass, and harmonicas played by Wayne Raney or Lonnie Glosson, added to the sound, which soon began making waves in country music, known simply as "Hillbilly Boogie." Their biggest hit became "Blues Stay Away from Me" in 1949. 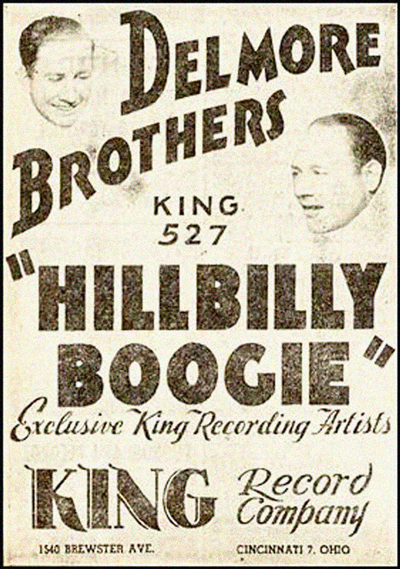 Today's selections came from a May 21, 1952, session at the King Recording Studio in Cincinnati. The line-up included Alton Delmore on vocals and rhythm guitar, Rabon Delmore on vocals and tenor guitar, an unknown musician on bass, as well as Wayne Raney and Lonnie Glosson on harmonicas. It was one of their last sessions for King, before Rabon died of lung cancer in December 1952, at the age of 36 years. Alton, struggling with mental and health problems after the loss of his father, his brother, and his daughter, moved back to Hunstville, Alabama, but quit the music business. He recorded one last single for the small Linco label out of Fayetteville, Tennessee, in 1958. You can hear the melancholy and trouble of his life, listening to "Good Times in Memphis." Alton died on June 8, 1964. His biography, "Truth is Stranger than Publicity," was posthumously published in 1977.
hi, sorry - you posted two mediafire tracks which are the same a-side. please can you post muddy water. thanks. love your work. 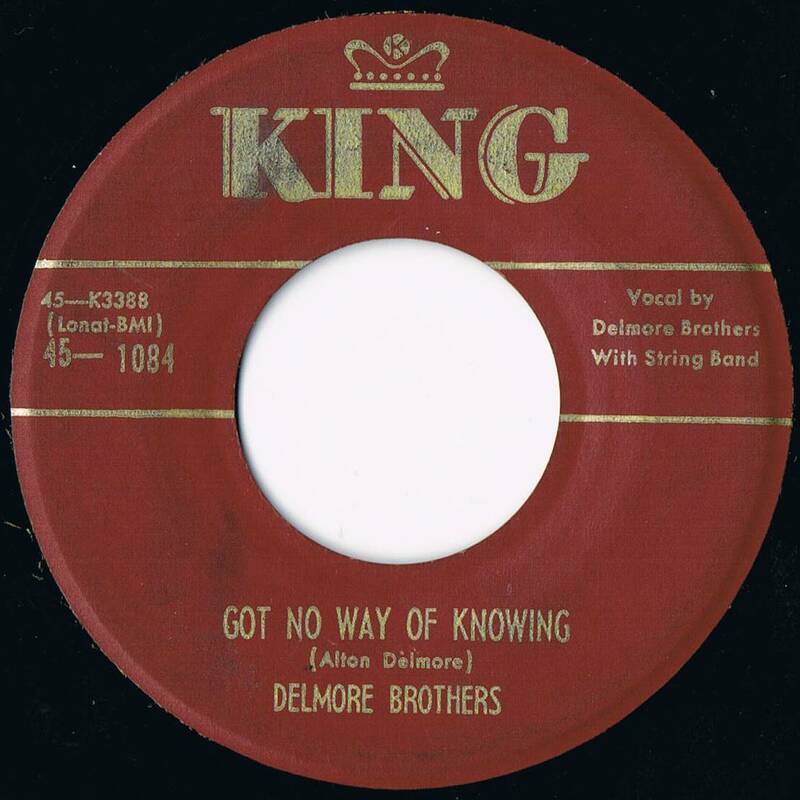 Quick and superior overview of the Delmore Brothers. I have most of their recordings as well as the Brown's Ferry Four cuts on CD's. The Browns Ferry Four at various times included Red Foley and Clyde Moody on the recording sessions to good advantage. I would suggest the Louvin Brothers LP T-1449 "Tribute To The Delmore Brothers" on Capitol Records in 1960 and the re-issue CD from 1996 which has copious liner notes about the session and the players as well as historical information on the Delmores. Rabon Delmore's tenor guitar was used on the sessions and played by Ira Louvin to capture the Delmore Brothers sound,enhanced by the superior sound quality of the 1960 stereo technology. An informative comment as always, Mr. O'Brien. Visit website freeringtonedownload.mobi to download latest ringtones, hot ringtones 2017 for your mobile! You can download country music ringtones free at my website! Free Sam Hunt – House Party ringtone is country music ringtones to download free for your mobile!